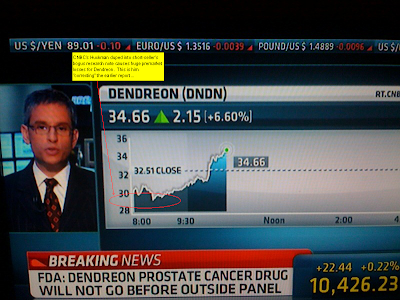 Shares of Dendreon (DNDN) traded down sharply earlier this morning on reports that it would be subject to a surprise, unexpected additional FDA advisory panel. The stock sold off hard, as any unanticipated news spooks investors with this company. Their drug Provenge has shown dramatic results extending the lives of those with advanced prostate cancer, and is widely believed to win final approval around May1. The report that spooked the market this morning was issued by Dr. Elliott Favus. Among the recipients of his note titled "Reasons to Sell" was John Huckman of CNBC, who it appears was used as a "useful idiot" in this case. As the stock traded down this morning, analysts who know the company intimately came rushing to defend the stock. Roth Capital said regarding another FDA review, "Why would an Advisory Committee be a bad thing?" They said investors should buy the stock on weakness, as they had serious doubts there would actually be a review, and even if there is, it is not a worry. According to TheStreet.com, David Miller of Biotech Stock Research said "I think he's wrong, but even if he is right the panel voted positively last time. The data are stronger this time so I would expect another positive vote and the FDA to approve the drug so that prostate cancer patients can finally have access to this lifesaving drug." Dendreon came out and said there is no indication of an FDA panel review, and Bloomberg quoted FDA spokeswoman Burgess as confirming that there is not a scheduled review.